I am thrilled to announce that the Sweet and Sinister swap is back! It's a little bit different this year, so here's the scoop. It's TWO things, a private blog and a swap. The blog is called ArtsyMama's Best Halloween Ever and it will be filled with frequent posts with projects and tutorials from myself and some of my favorite artists to make this the best Halloween season ever. Over a dozen artists are coming up with projects just for the blog! I will have giveaways, inspiration and tons of other fun. For those of you that aren't as into Halloween, but really enjoy autumn, I will be sure and include lots of inspiration and ideas for embracing this wonderful season as well. What projects will we be working on? For those that are familiar with my annual swap, the sweet and sinister theme is all about vintage style black and white. You and your partner can exchange information about what style you prefer. Swap items can be Halloween oriented, but they don't need to be. However, almost everything should be black or white or both (can be any shade of white/cream/antique white, etc.) A splash of orange in there is ok. If you need inspiration, be sure and check out the swap flickr groups here and here. and a home decor item. The mail out date for the swap is October 10th! I will begin parterning people up immediately and will do so until the swap reaches 100 participants, or Sept. 1st. You will gain access to the blog right away and we will begin to get to know one another and be inspired. The tutorials officially begin September 1st. 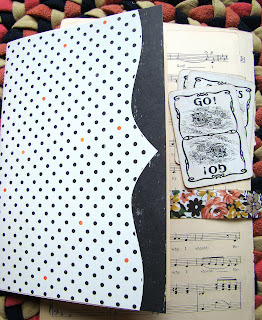 You can participate in BOTH the blog and the swap HERE. If you are signing up for the swap, please leave your name, address, contact info., blog or flickr url and mailing preference (are you willing to ship internationally) in the notes when you check out. Also, leave the email address that you want the swap invite sent to if that is different than your paypal email. If you would just like the blog only, please go HERE to sign up. Finally, be sure and grab a button from the wonderful Hope Wallace of Paper Relics to post on your blog. I think that's it! Let me know if you have any questions. Let the fun begin!! p.s. I just listed some handmade blank journals that will be the same as I what I use for my examples on the blog for our inspiration book. They are here! I had such a great swap last year!!! This year I will not be able to swap, but i will gladly join the blog!!! thanks for offering the 2 options. Thank you Kari...this sounds like a fun way to begin my favorite season! Love your swaps I've had fun Each year. Is it possible to do the swap with out the blog(though it would be sorely missed) You do such a great job. We've been working on less than 1/2 our income this year with fam of 6. So while my spirit is wanting the money manager side is holding the reins so to say. oh if I can could I stay local in U.S.
HOpe all is well! I wonder if your children avoid the halloween isles at Micheals like mine do.... at least the 10 and 8 yo the twin 4yo want to see it. sillies.. Sounds like fun, but I too like everyone else am short this year, I do Love Halloween! Autumn sent me over to check it all oot! I would really like to join your swap. Can you tell me how to sign up? Sounds like so much fun. Halloween is one of my favorite holidays. Christmas is my very favorite holiday.